Boutique browsers try to scratch out a living by scratching out a niche underserved by the usual suspects. Brave is one of those browsers. Brave has gotten more attention than most new browsers, partly because a co-founder was one of those who kick-started Mozilla's Firefox, partly because of its very unusual - some say parasitical - business model. That model, which relies on stripping every site of every ad, then substituting different ads, came under attack almost immediately from publishers that depended on online advertising for theirlivelihood. "Your plan to use our content to sell your advertising is indistinguishable from a plan to steal our content to publish on your own website [emphasis in original]," lawyers for 17 newspaper publishers wrote in a letter to Brave Software in April 2016. The Brave browser can show users how many ad trackers (and ads) have been blocked. What makes Brave different from other browsers? What sets Brave apart is its aggressive anti-ad attitude. The browser was built to strip online ads from websites and its maker's business model relies not only on ad blocking, but on replacing the scratched-out ads with advertisements from its own network. It's as if a new TV network announced it would use technology to remove ads from other networks' programs, then rebroadcast those programs with ads of its own devising, ads that it sold. 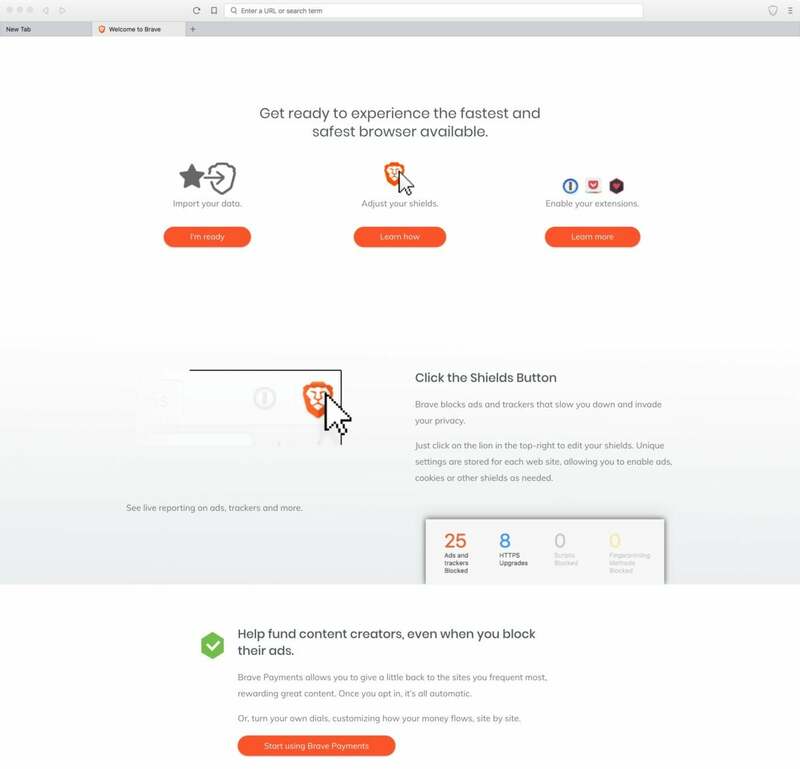 The browser startup screen details how Brave works and how it can be customized. 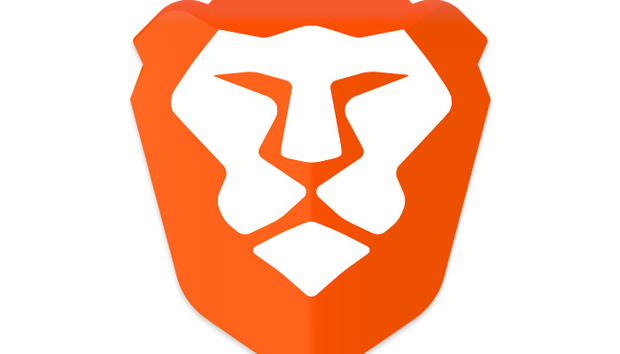 Brave also eliminates all ad trackers, the often-tiny page components advertisers and site publishers deploy to identify users so that they know what other sites those users visit or have visited. Trackers are used by ad networks to show products similar to ones purchased, or just considered, leading to the meme of persistently seeing the same ad no matter where one navigates. Does Brave block ads within search results? No. Brave doesn't lay a finger on those, including the ubiquitous AdWords advertisements within Google's results. (Google will soon rebrand AdWords as "Google Ads.") That's not a surprise: Ad blocking extensions don't stymie search ads either. 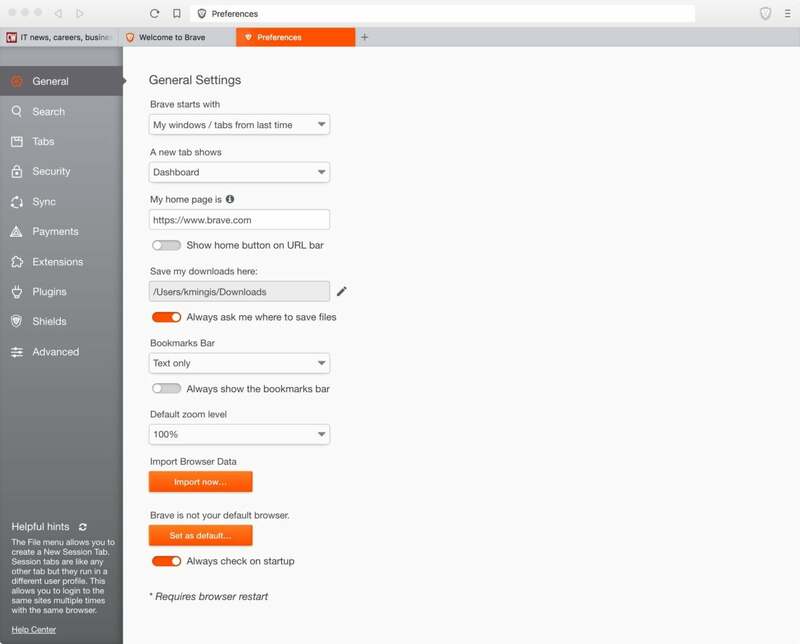 Brave's default browser behavior can be customed in preferences. On iOS, Brave instead relies on the WebKit, the open-source foundation that also powers Apple's Safari browser. WebKit is required as the backbone of any third-party browser submitted to Apple's App Store. Other browsers that depend on Chromium include Opera and Qihoo 360, one of the most popular Chinese-made browsers. Can Brave run Chrome's extensions? Some have been prepped for use in Brave, but only a handful. 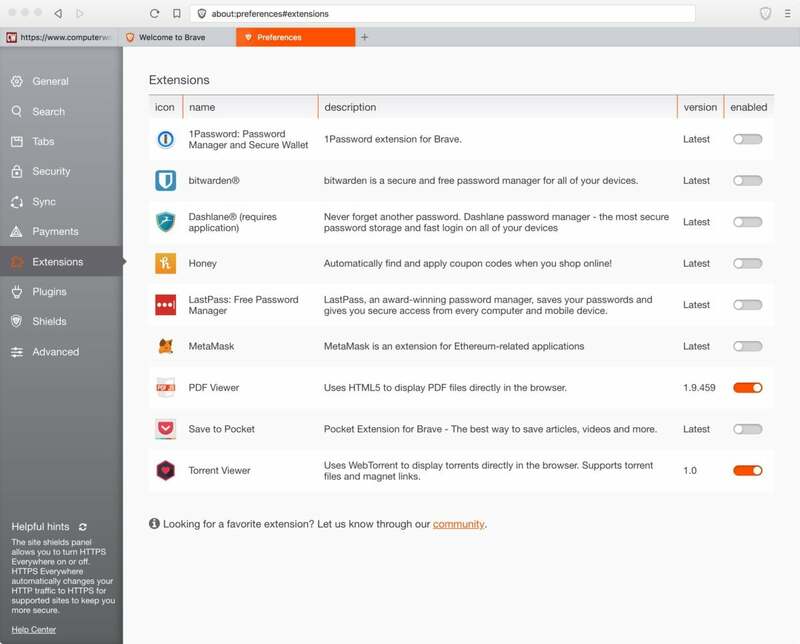 They include add-ons for several third-party password managers - 1Password, Bitwarden, Dashlane and LastPass - as well as others that display PDFs within the browser and save content to Pocket for later reading. The list of compatible add-ons can be found within the browser by choosing "Extensions" from the Window menu. Brave can run some Chrome extensions, but the number is limited. Brave boasts of two things: Its speed and the privacy it provides users. Both result from its ad-stripping strategy. On the desktop, Brave loads pages twice as fast as Chrome and Firefox, the No. 1 and No. 3 browsers in the world as ranked by analytics vendor Net Applications. On a smartphone, Brave loads pages up to eight times faster than Chrome (Android) or Safari (iOS). By eliminating ad trackers, Brave blocks efforts by advertisers to first identify users, then follow those users. That makes Brave users more anonymous, Brave Software has argued. "(Users) especially don't like it when large companies map together their online behavior and offline behavior," the firm said in an early blog post. The company has also sworn that it does not, and will not, store any user data on its servers. "We keep user data out of our cloud Brave Vault by default," Eich wrote in his inaugural post in 2016. "It's better for you and us that we don't store any of your data without your permission." For speed and privacy, what makes Brave special? It's true that some of the Big Four browsers block ads or at least some ads - Chrome blocks only those it contends are the most irritating and annoying, Mozilla's Firefox will sport an ad-blocker before year's end, but it's not clear what that blocker will, well, block - or prevent some ad tracking (as with Safari's tentative moves with Apple's Intelligent Tracking Protection, or ITP). But none do both and none go as far as Brave. The only real rival in this regard is Epic, another niche browser. Brave's big advantage – blocking ads and trackers? Unlike other browsers that block ads - whether natively like Epic, or when equipped with an ad-blocking add-on - Brave envisions a replacement ad ecosystem for the ads and trackers it wipes off websites. While that ecosystem is not yet complete, its framework has been described by Brave Software, and the company has made progress in implementing it. Brave will scrub sites of ads and ad tracking, then replace those ads with its own advertisement, which will not be individually targeted but instead aimed at an anonymous aggregate of the browser's user base. Brave has said It went that route rather than a simpler all-ad-elimination model because, while few users relish ads, many realize that without them, the commercial web as it now exists would be nigh impossible. That's why, claimed Brave, it will not only do an ad swap - its advertisements for those originally displayed by a site - but create a monetary system that ultimately will compensate those same websites. It's definitely a user-centric model. "We're building a solution designed to ... give users the fair deal they deserve for coming to the web to browse and contribute," Eich maintained two years ago. How will Brave and its users 'pay' websites? The foundation of the Brave economy will be "Basic Attention Tokens" or BATs, which have a value derived from a cyber-currency. Those tokens will be awarded based on user attention, or more plainly, time spent viewing ads and content. Brave users who agree to receive ads will be rewarded with BATs; the tokens can be passed to publishers as support for their sites. Alternately, Brave envisions users trading their tokens for premium content or advanced site features. The financial foundation of Brave relies on "Basic Attention Tokens" or BATs, which are tied to a cyber-currency and used to support websites. 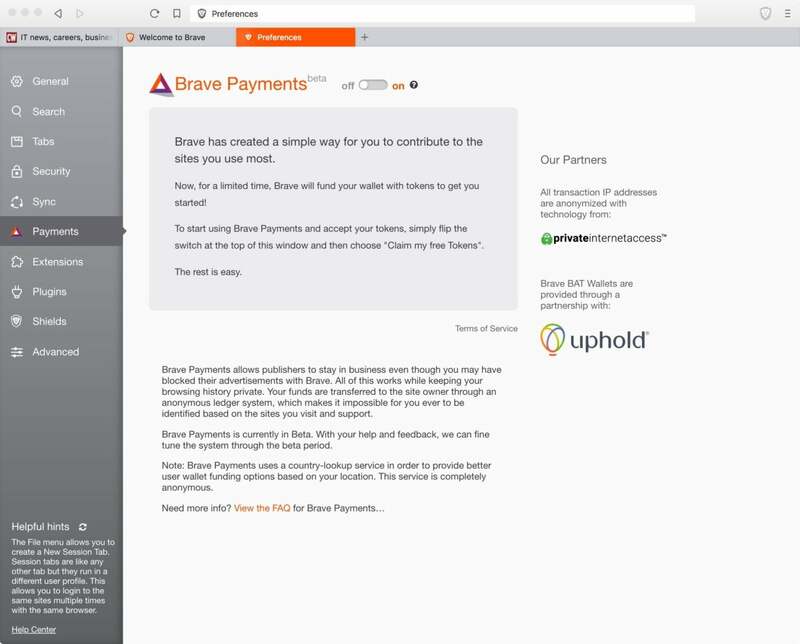 Volunteer testers are now receiving ads, although it's unclear when Brave will actually begin serving ads to all users who opt in, or when the exchanging-BATs part of the process will be ready. As of July 23, a single BAT was worth about 34 cents, up from 25 cents a month prior but still significantly off the peak value of 86 cents in January. Some browsers don't have to worry about making money because they're just a cog in a much larger machine. For example, Chrome, Microsoft's Edge and Apple's Safari don't need to turn a profit to survive because their parent organizations value them for non-monetary reasons as well as their ability to produce revenue in some fashion. Other browsers, notably Firefox, are just the opposite: They must find a way to generate revenue. Mozilla does that by striking deals with search firms for default placement in the browser; the current deal is with Google. Brave Software's entire financial foundation is unclear - although it raised $35 million a year ago in just seconds by selling the BAT cryptocurrency to investors - but clearly it's expecting that its take, as much as 30% of the BATs earned by users, will be a revenue generator as it sells those BATs to advertisers. How much that will be, or even whether it will be enough to keep the lights on, is anyone's guess at this point. Brave has other monetary means, as it kept a third of the 1.5 billion BATs - that billion and a half is a cap, the company said - for itself (200 million BATs) and as starter seed for browser users' wallets (300 million BATs). At the current BAT value, Brave's 200 million equaled just over $70 million. That money, Brave said last year in a white paper, would be used "to build out the Blockchain-based digital advertising system." How many people are using Brave? 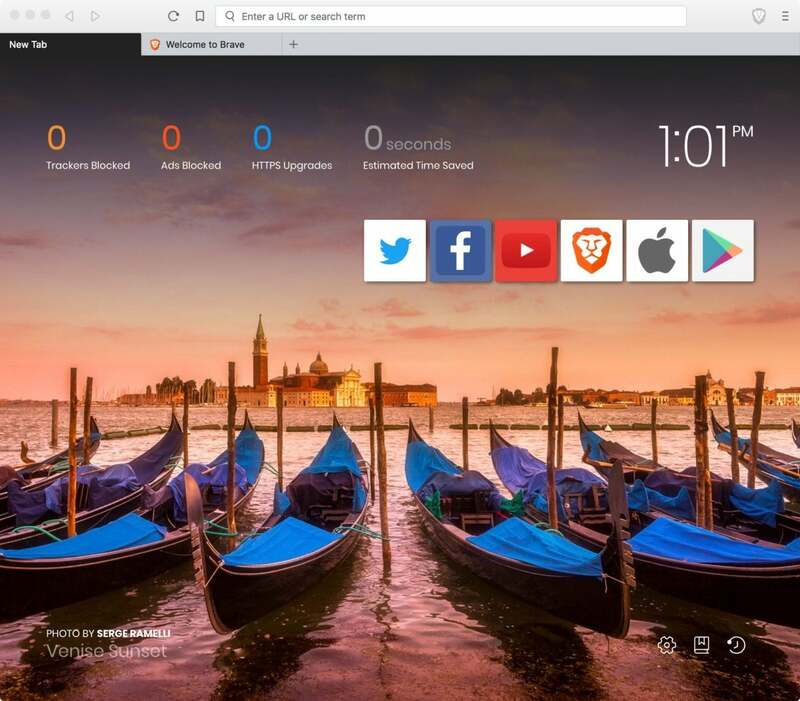 According to Brave's latest announcement, the browser had over 3.1 million monthly active users as of July 1. The company added that at its current pace, it would make the 5-million mark before year's end. Where can I download Brave? Brave can be downloaded from this page of Brave Software's site. The page should automatically recognize the device's operating system and offer the appropriate version. If it doesn't, select from the choices at the bottom of the page: Windows x86 or Windows x64, Windows 7 or later; macOS 10.9 or later; or Linux x64 for Debian, Fedora, Ming, openSUSE and Ubuntu. Mobile versions of the Brave browser (for iOS and Android) are available in the App Store and in Google Play, respectively.